So here is the problem. 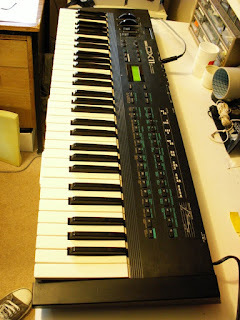 The LCD on my Yamaha DX11 synthesizer has faded so much that I can barely see what instrument I am playing - as you can see in the photo above. It appears that the seals around the edge of the glass panel have failed, because the fading started at the outside edges and has progressed inwards. When switched off the LCD is a peculiar pink colour, which you can see in the photo below. The old LCD is on the right, a new one on the left. (Note that I have already transferred the plastic bezel from the old LCD to the new one - it is held in place by a double-sided adhesive strip). But where do you get replacement parts for an instrument which is probably over 30 years old? I opened up the the synth and measured the size of the thing and then trawled through catalogues looking for similar devices. I found the Displaytech 162B-BC-BC looked to be the right shape and size, and the row of pins was in the same position along the bottom edge. The Displaytech part has 16 pins instead of 14, but I could see from the datasheet that pins 1 and 2 were connected to the backlight. It was readily available from RS Components at £7.94 (Part number 532-6379) so I ordered one. 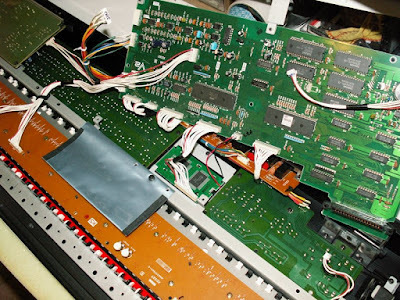 While I waited for it to arrive I found the Service Manual for the DX11 on line, and that confirmed that, apart from the two extra pins for the LED backlight, the connections were exactly the same on the two displays. I had to extend the wires on the LED backlight, and my attempts at desoldering the 14-pin header on the old display were unsuccessful, so I cut the wires one by one, and soldered them to the new display module. 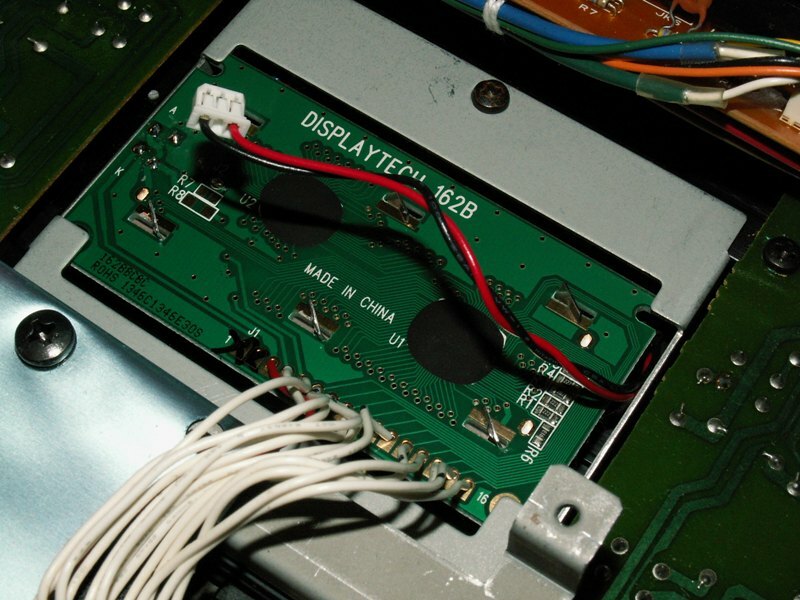 The wiring between the connector and the module is 1 to 1, but since the wires are not colour-coded (except for pin 1), it is wise to move them one at a time. In the picture below, you can see the LCD module, nestling in the middle, between the larger PCBs. It is held in place by a metal surround which is secured by a single screw. This picture shows the two modules side, by side, before I transferred the wires, so the old one is on the right and the new one on the left. The picture below shows the new module in position, with the metal surround back in in place and the LED backlight lead waiting to be connected back in the socket on the main board. It was a great delight to see the new panel light up with nice clear text. I was expecting to have to make some adjustment to the contrast control resistor, but this was not necessary. The Displaytech module seems to be electrically very similar - even the character fonts seem to be equivalent. A thin metalic strip of the bezel is visible at the top and bottom of the LCD window, and it might be nice to black that out with a strip of black tape or even marker pen. But I couldn't be bothered to take it all apart again. Happy Christmas and 73 to you all. I love the DX11! I haven't really seen much of this keyboard around but the DX7 is totally a retro synth dream. I need to really check out the DX11 and see how the sounds are compared to the DX7. Props on fixing that LCD screen. That looks like something that would be way too hard for me to do. Thanks Brian. The DX11 has fewer operators, but they can have different waveforms (Sine, square, triangle). The DX7 has more operators, but they can only be sine wave ... not sure which is best! FM synths excel at making metallic sounds, like chimes and bells. I just enjoy playing it from time to time. Thanks. That is a great tip. Good price and looks like they ship overseas too. I am so glad that I found this blog post, I have been having the same issue. This is such a fantastic instrument but I was having trouble reading the LCD display too. I will definitely be buying the components and having a go at fixing mine. I really appreciate the detailed instructions and photos, such an awesome find, thanks!